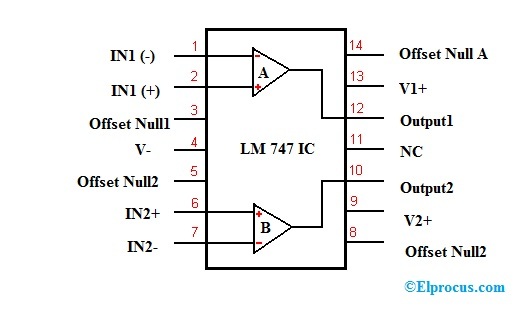 The LM747 integrated circuit is a general purpose double op-amp or operational amplifier. These amplifiers share a common bias network as well as leads to the power supply and working of amplifiers is totally independent. An extra feature of the IC LM747 mainly includes no latch-up as the range of an input common mode exceeded, liberty from oscillations, as well as pack up flexibility. The LM747C IC or LM747E IC is equal to the LM747 IC or LM747A IC apart from the LM747C IC or LM747E IC. The LM 747 IC is a 14 pin dual op-amp device. The pin configuration with the description for every pin in the op-amp1 as well as op-amp2 is explained below. Pin12 (1OUT): Output pin of the first op-amp. Pin1 (1 IN-): Inverting input of the first op-amp. Pin2 (1 IN+): Non-inverting input of the first op-amp. Pins 3 & 14 (Offset Null1): These pins are used for removing the offset voltage, and balance the i/p voltages for the first op-amp. Pin13 (V1+): Positive voltage supply for the first op-amp. Pin6 (2IN+): Non-inverting input of the second op-amp. Pin7 (2 IN-): Inverting input of the second op-amp. Pin10 (2OUT): Output pin of the second op-amp. Pin5 & 8(Offset Null 2): This pin is used for removing the offset voltage as well as for balancing the input voltages for the second op-amp. This IC is available in several packages as well as the selection can be done based on the requirement. The features of this LM747 IC mainly include the following. As discussed earlier, that IC LM747 includes two general purpose op-amps and this chip can be used for designing any kind of operational amplifier circuits namely comparator, mathematical operations, and otherwise differential amplification. Furthermore, the two operational amplifiers can execute two dissimilar functions simultaneously. Also, this IC includes offset pins to make the output more precise in some kind of applications. A decade ago, this IC is more popular however at present there are several operational amplifier chips are more precise as well as more proficient. The circuit diagram of LM747 IC is shown below. The internal connection of this circuit uses two operational amplifiers is shown below. These ICs are used to design most of the operational amplifier based circuits such as a comparator, differential amplification, voltage follower, & mathematical operations. 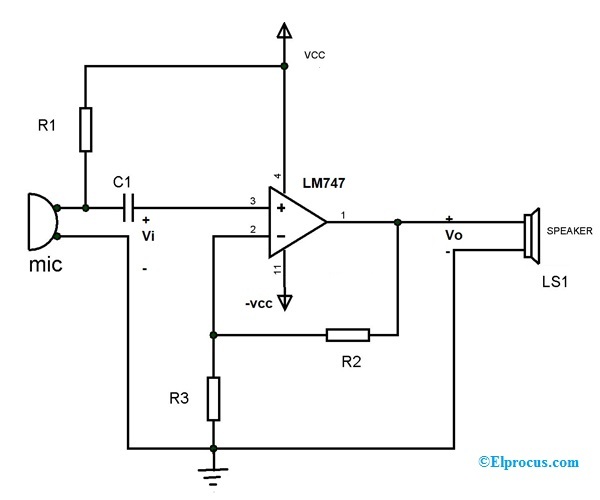 This circuit can be built with a single operational amplifier for designing a simple preamplifier circuit using a microphone is shown below. In the following circuit, operational amplifier acts as a non-inverting amplifier. The output signal of a microphone is connected like input to operational amplifier for amplification. The cutting of the DC signal can be done from microphone using HPF which can be formed with resistor R1 and capacitor C1. The output which is amplified can be heard from the small speaker which is connected at the output. The resistors R2, as well as R3, can be formed a feedback loop for the op-amp’s non- inverting amplifier. For instance, consider the values of R2 = 1 Mega Ohm, R3 = 1. This voltage shows across the small speaker so that we can hear to the sound. And with this, we have designed the op-amp based amplifier circuit which can be used to design the different op-amp based applications. The applications of LM747 IC include the following. Thus, this is all about the LM IC 747 is a dual op-amp and includes two 741 operational amplifiers. These amplifiers have a familiar bias network as well as leads to the power supply. Or else, their working is entirely autonomous, and the op-amp characteristics are whenever the range of input common mode is exceeded, then there is no latch-up, freedom from oscillations. Here is a question for you, what is the main function of IC LM747?